by Brianna Crandall — August 22, 2018 — If your company is looking for new space, the number of new construction starts varied among the top US markets so far this year — which can also affect rents. 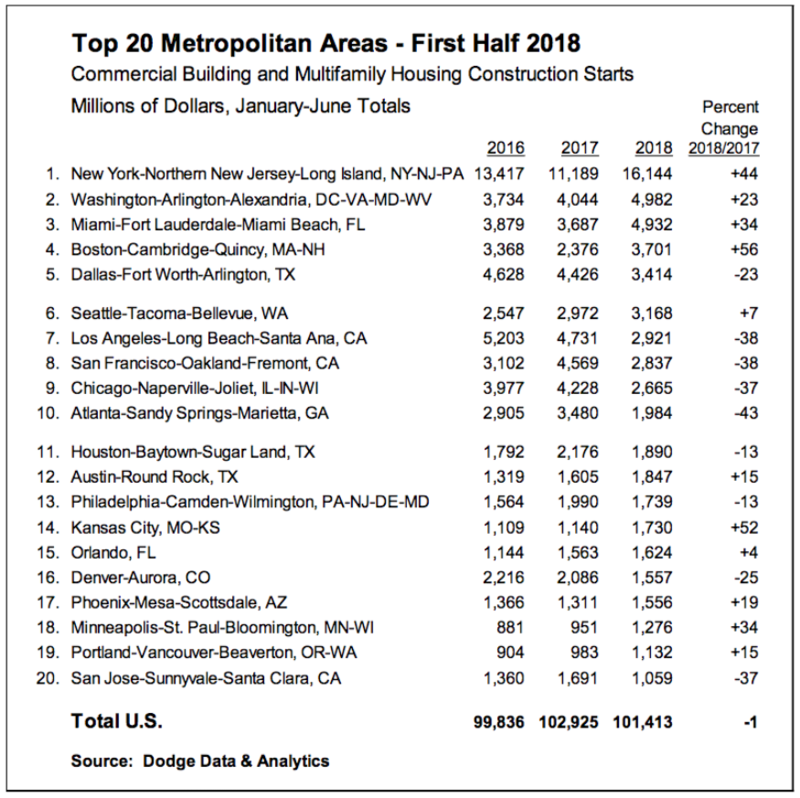 During the first half of 2018, five of the top ten metropolitan markets for commercial and multifamily construction starts ranked by dollar volume showed increased activity compared to a year ago, according to Dodge Data & Analytics. Of the top 20 markets, 11 were able to register gains. At the national level, the volume of commercial and multifamily construction starts during the first half of 2018 was $101.4 billion, down 1% from last year’s first half, although still 2% above what was reported during the first half of 2016. The New York, NY, metropolitan area, at $16.1 billion during the first half of 2018, held onto its number one ranking and comprised 16% of the US commercial and multifamily total, helped by a 44% jump compared to a year ago. During the previous two years, the New York share of the US total had slipped to 14% in 2016 and 13% in 2017, after seeing its share reach a peak at 19% back in 2015. Other markets in the top ten showing growth during the first half of 2018 were Washington, DC ($5.0 billion), up 23%; Miami, FL ($4.9 billion), up 34%; Boston, MA ($3.7 billion), up 56%; and Seattle, WA ($3.2 billion), up 7%. Of these markets, the top four (New York; Washington, DC; Miami and Boston) showed renewed growth after the decreased activity reported for the full year 2017, while Seattle was able to maintain the upward track present last year. Metropolitan areas showing decreased activity for commercial and multifamily construction starts during the first half of 2018 were Dallas-Ft. Worth, TX ($3.4 billion), down 23%; Los Angeles, CA ($2.9 billion), down 38%; San Francisco, CA ($2.8 billion), down 38%; Chicago, IL ($2.7 billion), down 37%; and Atlanta, GA ($2.0 billion), down 43%. For those markets ranked 11 through 20, the six that registered first half 2018 gains were Austin, TX ($1.8 billion), up 15%; Kansas City, MO ($1.7 billion), up 52%; Orlando, FL ($1.6 billion), up 4%; Phoenix, AZ ($1.6 billion), up 19%; Minneapolis-St. Paul, MN ($1.3 billion), up 34%; and Portland, OR ($1.1 billion), up 15%. The four posting declines were Houston, TX ($1.9 billion), down 13%; Philadelphia, PA ($1.7 billion), down 13%; Denver, CO ($1.6 billion), down 25%; and San Jose, CA ($1.1 billion), down 37%. The commercial and multifamily total is comprised of office buildings, stores, hotels, warehouses, commercial garages, and multifamily housing. At the US level, the 1% drop for the commercial and multifamily total during the first half of 2018 reflected an 8% retreat for commercial building that was essentially balanced by an 8% increase for multifamily housing, according to the report. On a broader level for commercial building, lending standards for nonresidential building loans have eased slightly over the past two quarters. And, the rollback of some of the Dodd-Frank restraints on the banking sector may encourage mid-size banks to increase lending for commercial real estate. While the expansion for commercial building and multifamily construction starts has clearly decelerated, the near-term shift appears to be one towards a plateau as opposed to a decline. This is consistent with the recent pattern for commercial and multifamily construction starts by major metropolitan areas, which reveals a fairly equal balance between those markets still showing gains and those markets showing decreased activity. Table courtesy Dodge Data & Analytics. Click to enlarge. The 44% increase registered by the New York, NY, metropolitan area during the first half of 2018 was the result of an 83% hike for commercial building combined with 22% improvement for multifamily housing. Previously, construction starts had retreated 15% in 2016 and 13% in 2017, following a 62% surge back in 2015. New office construction starts soared 114% in the first half of 2018, although as a point of perspective it was still 25% below the robust volume reported during the first half of 2015. Large office projects that reached groundbreaking during the first half of 2018 were the $1.8 billion Spiral office building and the $480 million Hudson Commons office building addition, both in the Hudson Yards district of Manhattan, and the $233 million office portion of the $300 million One Willoughby Square mixed-use project in Brooklyn. Hotel construction had a strong first half of 2018, rising 246% with the lift coming from such projects as a $300 million Tribeach Holdings hotel, the $180 million Margaritaville Hotel, and the $125 million Hard Rock Hotel, all located in midtown Manhattan. As for the other commercial project types, garages were up 37%, but stores slipped 1% and warehouses fell 27%. The 22% increase for multifamily housing during the first half of 2018 reflected the start of 15 projects valued each at $100 million or more, led by the $700 million City View Tower at Court Square and the $550 million Queens Plaza Park Apartments, both in Long Island City, and the $232 million Journal Squared 2 apartment building in Jersey City, NJ. The Washington, DC, metropolitan area grew 23% during the first half of 2018, with commercial building up 31% and multifamily housing up 16%. During 2017, commercial and multifamily construction starts had retreated 15% for the full year after a 39% gain in 2016. New office construction starts were up 55% in the first half of 2018, lifted by the start of five data centers in Ashburn VA with a combined construction cost of $840 million. Other large office-related projects that reached groundbreaking during the first half of 2018 were the $245 million U.S. Citizenship and Immigration Services building in Suitland MD, the $153 million M St. office and television production studios in Washington, DC, the $140 million Stafford Place office renovation project in Arlington, VA, and the $75 million office portion of the Apex complex in Bethesda, MD. The performance by the other commercial project types was mixed, with gains for hotels (up 222%) and warehouses (up 1%), while declines were reported for commercial garages (down 24%) and stores (down 28%). There were three multifamily projects valued each at $100 million or more that reached groundbreaking during the first half of 2018. The Miami, FL, metropolitan area climbed 34% during the first half of 2018, with the boost coming from a 95% jump for multifamily housing, while commercial building settled back 6%. During 2017, the Miami, FL, market had fallen 20% for the full year after its 25% increase in 2016. The $2.8 billion of multifamily projects that reached groundbreaking during the first half of 2018 topped the $2.5 billion reported for the first half of 2016, which contributed to the record high $5.5 billion of multifamily construction starts reported for the full year 2016. There were eight multifamily projects valued each at $100 million or more that reached groundbreaking during the first half of 2018. On the commercial side, store construction increased 16%, lifted by the $271 million Bal Harbour Shops expansion in Bal Harbour. Gains were also reported for commercial garages (up 31%) and warehouses (up 15%), but declines were reported for office buildings (down 9%) and hotels (down 46%). The decline for hotel construction was relative to a strong first half of 2017, which included the $575 million hotel portion of the $900 million Seminole Hard Rock Hotel and Casino in Hollywood, FL. Commercial and multifamily construction starts in the Boston, MA, metropolitan area soared 56% during the first half of 2018. Previously, the commercial and multifamily total had dropped 27% for the full year 2017 after a 54% gain in 2016. Multifamily housing during the first half of 2018 jumped 146%, while commercial building slipped 4%. The multifamily dollar amount during the first half of 2018 was $2.3 billion, which topped the $2.0 billion in the first half of 2016 that contributed to the record high $3.2 billion reported for the full year 2016. There were four multifamily projects valued each at $100 million or more that reached groundbreaking during the first half of 2018, all located in Boston. Commercial building during the first half of 2018 slipped 4% from a year ago, due to varied behavior by its individual project types. Office construction starts registered a 26% gain, led by such projects as the $88 million addition to a Harrison Avenue office building in Boston and the $55 million renovation to the Bristol-Myers Squibb office building in Cambridge, MA. Store construction climbed 7% during the first half of 2018, but declines were reported for commercial garages (down 16%), warehouses (down 44%), and hotels (down 71%). The Dallas-Ft. Worth, TX, metropolitan area retreated 23% during the first half of 2018 from a year ago, as a 7% increase for multifamily housing was outweighed by 36% drop for commercial building. For the full year 2017, commercial and multifamily construction starts had fallen 12%, which followed very strong increases in 2015 (up 60%) and 2016 (up 28%). The commercial building total during the first half of 2018 featured a substantial decline for new office starts, down 52%, as well as weaker activity for hotels (down 56%), commercial garages (down 55%), and stores (down 14%), while new warehouse starts grew 6%. The first half of 2017 had seen the start of such projects as the $300 million American Airlines Trinity Campus and a $300 million Facebook data center, both in Ft. Worth, the $138 million Dallas County Records building complex in Dallas, and the $115 million Westin convention center hotel in Irving. The large commercial building projects entered as construction starts during the first half of 2018 were generally smaller in scale than last year, including another Facebook data center in Ft. Worth valued at $183 million and a $52 million bank corporate headquarters in McKinney, plus several large warehouse projects like the $71 million Gateway Logistics Center at DFW International Airport. Multifamily housing during the first half of 2018 was up 7% over a year ago, led by projects in Frisco and Dallas. The 7% increase for commercial and multifamily starts in the Seattle, WA, metropolitan area during the first half of 2018 was the result of a 66% surge for multifamily housing, which outweighed a 46% decline for commercial building. The Seattle, WA, metropolitan area registered yearly increases for its commercial and multifamily total from 2011 through 2017, including gains of 27% in 2016 and 8% in 2017, so the first half 2018 increase is maintaining a well-established upward track. There were five multifamily projects valued each at $100 million or more that reached groundbreaking during the first half of 2018, all located in Seattle. The first half 2018 decline for commercial building was relative to a strong first half of 2017, that included such projects as a $210 million office tower in Seattle and a $93 million Amazon distribution center in Sumner. The largest commercial projects that reached groundbreaking during the first half of 2018 were smaller in scale, led by the $52 million garage portion of the Seattle Times project, the $46 million garage portion of the $810 million Washington State Convention Center project (whose $764 million convention center portion is classified as an institutional building, which is not included in the commercial building total), and the $39 million hotel portion of a $140 million hotel and casino in Tulalip. The Los Angeles, CA, metropolitan area posted a 38% decline for commercial and multifamily construction starts during the first half of 2018. Yearly growth had been registered by this metropolitan area from 2010 through 2016, before a 15% drop was reported for 2017. Multifamily housing construction starts retreated 48% during the first half of 2018, compared to last year’s first half. While the first half of 2017 had seven multifamily projects valued at $100 million or more that reached groundbreaking, there was just one such project during the first half of 2018, in Santa Monica. Commercial building dropped 22% from its elevated first half 2017 amount, that included the start of such projects as the $106 million hotel portion of the One Beverly Hills mixed-use development, a $69 million logistics center in Arcadia, and the $60 million renovation of the Burbank Town Center in Burbank. Within the commercial total, declines were reported for stores (down 29%), hotels (down 39%), and warehouses (down 86%), while gains were reported for office buildings (up 18%) and commercial garages (up 10%). The office category was lifted by the start of the $116 million Academy Square office building in Los Angeles and an $80 million office building in Playa Vista, while the garage category was lifted by the start of a $135 million garage at Disneyland in Anaheim. Commercial and multifamily construction starts in the San Francisco, CA, metropolitan area fell 38% during the first half of 2018 from the elevated activity during last year’s first half. This metropolitan area had shown strong annual increases during the past two years, with activity up 95% in 2016 and another 30% in 2017. The first half of 2017 included the start of several very large projects, led by the $1.3 billion Oceanwide Center tower in San Francisco, with the following allocation by structure type — office building at $780 million, multifamily housing at $387 million, hotel at $95 million, and garage at $38 million. Other large projects that reached groundbreaking during the first half of 2017 included the $361 million office portion of the $1.0 billion Golden State Warriors arena complex in San Francisco and a $310 million Facebook office building in Menlo Park. The commercial building amount during the first half of 2018 was down 51% from a year ago, with declines for offices (down 81%), stores (down 62%), and garages (down 18%), while gains were reported for hotels (up 84%) and warehouses (up 110%). The hotel category was lifted by the start of the $225 million Grand Hyatt Airport Hotel at San Francisco International Airport, while the warehouse category was lifted by the start of a $107 million research and development complex in Fremont. Multifamily housing during the first half of 2018 was down 19% from its first half 2017 amount, although the current year has seen groundbreaking for multifamily projects in Oakland and San Francisco. The Chicago, IL, metropolitan area registered a 37% decline for commercial and multifamily construction starts in the first half of 2018, with commercial building down 11% and multifamily housing down 61%. The first half of 2017 had featured the start of several very large projects, including the $650 million One Grant Park multifamily high-rise, the $500 million renovation of the Willis Tower, and the $280 million One South Halstead multifamily high-rise, all located in Chicago. The metropolitan area had experienced a particularly strong level of commercial and multifamily construction starts back in 2016, when activity climbed 41%, and while starts fell 26% for 2017, as a whole it was still a strong year by recent historical standards. During the first half of 2018, the largest multifamily projects were in Chicago, Northbrook and Lisle. The commercial categories during the first half of 2018 showed a varied performance, with gains reported for office buildings (up 27%) and commercial garages (up 1%), while declines were reported for stores (down 30%), hotels (down 36%), and warehouses (down 67%). There were several noteworthy commercial building projects that reached groundbreaking during the first half of 2018, including the $665 million 110 North Wacker Drive office tower in Chicago, the $130 million parking garage expansion at Midway International Airport, and a $100 million Hilton Hotel in Chicago. The Atlanta, GA, metropolitan area witnessed a 43% reduction for commercial and multifamily construction starts during the first half of 2018 compared to a year ago. This metropolitan area had been one of the “latecomers” to the commercial and multifamily expansion, as it showed strong yearly growth over the past two years, with 2016 up 58% and 2017 up 25%. Commercial building during the first half of 2018 was down 51% compared to a strong first half of 2017 that included the start of such projects as the $240 million Coda Building, the $190 million Kroger store and office building, and a $120 million UPS logistics center, all located in Atlanta. By individual commercial category, across-the-board declines were reported compared to a year ago, with stores down 8%, hotels down 42%, commercial garages down 45%, warehouses down 51%, and office buildings down 65%. The noteworthy commercial projects that reached groundbreaking during the first half of 2018 were the $80 million T3 West Midtown office building in Atlanta, a $45 million warehouse in Union City, and the $35 million 740 West Peachtree office building in Atlanta. Multifamily housing during the first half of 2018 was down 33% compared to a year ago, which included nine multifamily projects valued each at $50 million or greater. In the first half of 2018 there were four such projects, all located in Atlanta. For additional details about the construction starts in each city (particularly the multifamily projects), see the announcement on the Dodge Data & Analytics site. The company provides analytics and software-based workflow integration solutions for the construction industry. Find out how the US Navy is getting safe, sustainable modular offices quickly and at a low price point September 26, 2018 In "Contract Awards"